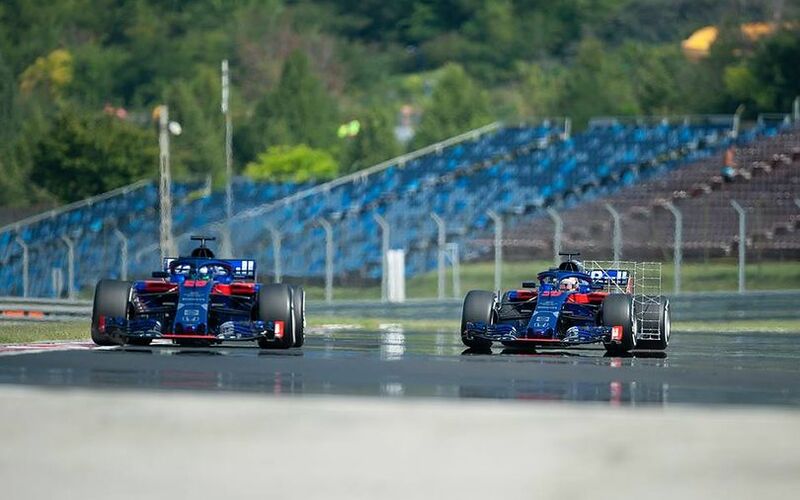 Formula One stayed at the Hungaroring after last weekend’s Hungarian Grand Prix for its second and last in-season testing session. F1Technical.net’s Balázs Szabó reports from the track after the second and final in-season testing. 1. Each team had access to a total of 110 sets of Pirelli tyres during the eight-day-long pre-season testing and the two two-day-long in-season test sessions. F1Technical.net learned from Pirelli’s head of motorsport Mario Isola that teams can choose the number of sets and type of compounds which they want to use at a given test session, they only have to adhere to the limit of 110 sets during these 12 testing days. 2. Williams was one of the teams to bring the new simplified 2019 front wing on to the track at the Hungaroring. The Grove-based squad was the most diligent team of all, carrying out multiple runs with the new wing which sits 25mm lower and is 200mm wider. These tests were completed by Robert Kubica in the early and late hours of the second test day. 3. In pre-season tests in Barcelona cars with Ferrari engines created really large quantities of white smoke, especially before leaving the garage and practice starts. Ferrari-powered cars continued this trend at the Hungaroring tests. F1Technical.net’s Balázs Szabó was standing on the pit exit where driver pull over for start practices. Kimi Räikkönen’s Ferrari was producing a smaller amount of white smoke while Antonio Giovinazzi’s Sauber released a huge plume of smoke through the letterbox-shaped rectangular vent directly underneath the rain light housed within the rear crash structure. 4. Despite being the leading force in terms of starts, Ferrari continued to work hard on that element. Kimi Räikkönen pulled over a lot particularly in the morning session of the second day of the Hungaroring running before going out on the track. 6. Red Bull stood out with its stunning sparks. Since its introduction, every car has been producing sparks which are from the titanium skid blocks embedded in the legality plank on the underside of the floor. However, Red Bull were seemingly creating significantly higher amount of sparks at the end of the Hungaroring’s start-finish straight. 7. Huge number of Polish fans flocked to the Hungaroring over the weekend. Interestingly, many fans arrived on Thursday even if Kubica had not had any on-track appearances until the Wednesday test session. Fans were more passionate than any other fan groups over the weekend. The Polish driver came to the pit wall over the lunch break and after the session to wave to his countrymen. 8. George Russel might have broken Antonio Giovinazzi’s unofficial track record which the Italian set on Tuesday, but it was Kimi Räikkönen who was controlling the pace over the second day. The Finn’s best time on soft was a 1:15.8 which was faster than any other lap time over the Grand Prix weekend. The Espoo-born driver had only two sets of hypersofts available which he used in the dying minutes of the session. 9. Teams often use test sessions to invite guests who can get a glimpse at how Formula One environment works. Without stress and hectic of a race weekend, they can show their motorhomes, the paddock and the processes within their garages. It was the Renault team at the Hungaroring which had a relatively large group of guests over the two test days. 10. Many fans are stunningly passionate about their heros. After yesterday’s test session, a smaller group of Toro Rosso fans was long waiting for the two drivers of the Faenza-based team. They were rewarded as both Pierre Gasly and Brendon Hartely stopped at the Hungaroring main entrance to share out a few autograph cards.